Happy New Year, alumni! Here are the latest updates from your Columbia community. 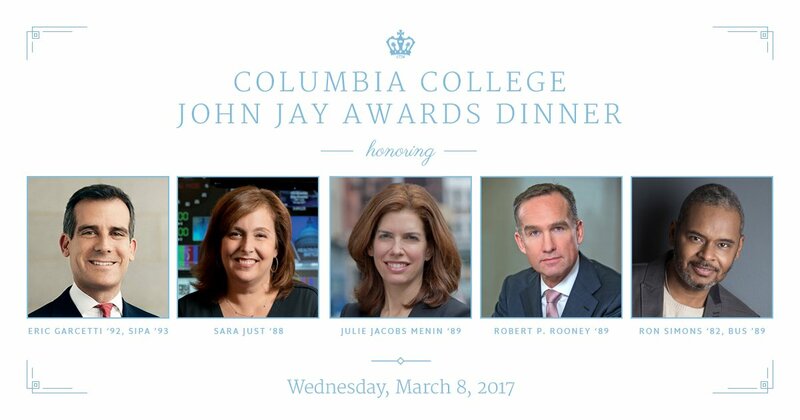 This week, Columbia College announced the five alumni recipients of the School's John Jay Award. The alumni will receive their awards at a dinner in March. Learn more about these dedicated and inspiring Columbians. Throughout 2017, members of the Columbia Career Coaches Network shared their valuable expertise with fellow alumni right here on The Low Down, with dozens of informative articles about job transitions, difficult workplace environments, rising through the ranks, and more. Check out some of the highlights. One of these coaches, Joshua Spodek '93CC, '96GSAS, '99GSAS, '06BUS just launched his own informative podcast, titled "Leadership and the Environment," featuring New York Times bestselling authors, top thought-leaders, and more. Take a listen. Natalia Kanem '80PS is a powerful voice for fellow women at the U.N. Agency for reproductive rights. Columbia received a $1 million grant from the Robert David Lion Gardiner Foundation to create web-based, interactive maps of Manhattan and Brooklyn during the late 19th and early 20th centuries. Donna MacPhee '89CC, president of the Columbia Alumni Association (CAA), shared a special holiday message with alumni. Miss the e-mail in your inbox? Read her letter here. Recent Alumni Winter Wonderland is back! Are you a member of the Classes of 2007-2017? Join fellow alumni at The Sky Room in Midtown Manhattan on January 26 for a night of festive treats and cheer. We hope to see you there! Secure your spot.